Jungle Jinx is the first level of the Lost World in Donkey Kong Country 2: Diddy's Kong Quest. It can be accessed via Klubba's Kiosk in Crocodile Cauldron. 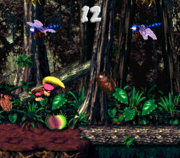 The level's name is a pun on the original Donkey Kong Country level, Jungle Hijinxs. This jungle level has spikes all over the place, and giant tires rolling out of control that can hurt Diddy Kong and Dixie Kong. If the Kongs plan their moves, they'll realize that they can bounce atop the tires, and use them as stepping stones to cross the spikes, in addition to reaching higher ground. Klampons, Kutlass, Zingers, Flitters and Spinys can be found here. From the start of the level, the Kongs must walk east and bounce off of a tire to reach the other end of a ledge. Then, they need to cross an abyss, and then land right on a tire. It will bounce them over some spikes and to safety. From there, they must use some more tires to get up to the top of two high ledges. After that, the heroes will need to jump over the giant tires rolling towards them, and watch out for a Zinger in the air. Once they drop down a high ledge, the monkeys will have to bounce off of another tire to get above two nasty Zingers, and get to the next ledge. Here, they will find a vicious Kutlass, whom they must defeat only when his blades are in the ground, and then travel eastward. After they beat a group of four Spinies, they should watch out for a Klampon and bounce atop of some more tires, which can throw them over Zingers. Then, they will reach an abyss, which is filled with sharp and unwanted spikes. They have to use the fast moving tire to jump over a Zinger, and then safely land on the next ledge. From there, the heroes must cross a small gap and bounce off of several tires to get over more dangerous spikes. Once they pass that part, they need to jump down a ledge, hop off a Flitter, and hit into the Star Barrel. Halfway through the level, the monkeys will have to travel over the path and leap over another small gap. After that, they must dodge some enemies, including the quick foe, Kutlass. Then, they need to bounce off of several tire, and get over rows of jagged spikes sticking out of the ground. From there, the monkeys must defeat a couple of Klampons, and soon hop down another ledge. A tire will sweep them away from the ground, though, but also save them from possibly landing on the thorny spikes. The Kongs have to jump over tires and other hazards, until they meet up with a huge abyss. This time, there are no tires to help them, so they must follow the banana trail downwards, while trying to stay between the Zingers nearby. They will land into some barrels. With good aim, the heroes should shoot carefully to all the barrels and soon get back up to the other side. Here, they need to bounce off of more tire to get over a few spikes, and then another gap. After that, the monkeys must face their biggest challenge yet. They will have to get over many spikes, using several tires. While doing this, they need to also watch out for the gaps below them, and do their best not to fall in one. Finally, they should make it safely to the other end of the area, and travel more eastward. Once they pass a few enemies and abysses, the heroes will eventually find the End of Level Target. When they hit it, they will be able to exit the level. DK Coin: A reward for finishing the bonus level. K: Above the first area with spikes. O: To the left of a lone Flitter above some spikes. If the heroes pass the Star Barrel, they've gone too far; they can just proceed west of the Star Barrel to get to it. N: Past two Klampons, the "N" Letter is above some spikes. G: A prize at the End of Level Target. To get the Golden Feather, the Kongs must get slightly past the Star Barrel, where they will meet a Kutlass. Then, they need to roll into the pit to the right, and safely jump out. As they do this, they should grab the feather, watching out for the sharp spikes around them, and even the tires that can push them off track. After passing the letter K, the Kongs should make their way past a group of four Spinies. To the right of these foes is a pit containing two Dixie Barrels. Dixie Kong, the only monkey who can use these barrels, must jump into the nearest Dixie Barrel to be shot to the next. While in mid-air, she is shot to the photograph, which can be used for the Kongs' scrapbook. Before the Star Barrel, the Kongs should investigate the abyss behind the Flitter. They will see the letter O, which they must roll to, and then jump to the left to land into the Bonus Barrel. 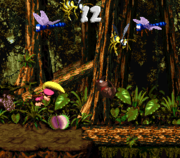 In its Bonus Level, the heroes needs to use their Team Up move to throw a monkey at the above Flitters. They must beware though, as the Zingers orbit those foes, and can end the Bonus Stage with one touch. When all the Flitters are beat, the DK Coin will appear, instead of the usually obtained Kremkoin. Dixie celebrates after finishing the level. Like Klobber Karnage, the Bonus Area's colors were changed between the two versions of the original Super Nintendo Entertainment System release. This page was last edited on April 6, 2019, at 02:40.